A mortgage loan is typically assigned several times during its term, and may be held by one entity but serviced by another. Different disclosure requirements apply depending upon whether information is sought about the ownership of the mortgage loan or its servicing. Knowing exactly who owns and services the mortgage is a critical first step to negotiating a binding workout or loan modification. The information is needed to send a notice of rescission under the Truth in Lending Act, to identify the proper party to name and serve in a lien avoidance proceeding, and to identify other potential parties in litigation. This information may also provide a defense to foreclosure or stay relief in bankruptcy if these proceedings are not initiated by a proper party. The Truth in Lending Act requires the loan servicer to tell the borrower who the actual holder of the mortgage really is.3 Upon written request from the borrower, the servicer must state the name, address, and telephone number of the owner of the obligation or the master servicer of the obligation. One problem with this provision’s enforcement had been the lack of a clear remedy for the servicer’s non-compliance. 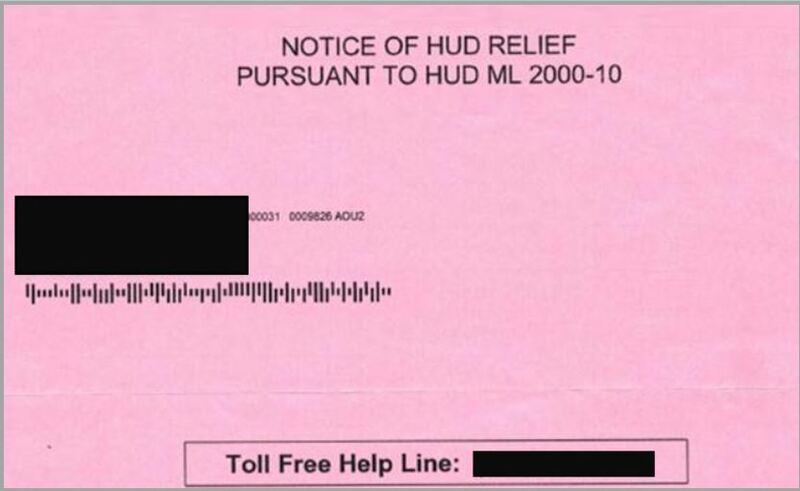 However, the Helping Families Save Their HomesAct of 20095 amends TILA to explicitly provide that violations may be remedied byTILA’s private right of action found in § 1640(a), which includes recovery of actualdamages, statutory damages, costs and attorney fees.6 The amendment adds the ownerdisclosure provision found in § 1641(f)(2) to the list of TILA requirements that give rise to a cause of action against the creditor if there is a failure to comply. See NCLC Foreclosures (2d ed. 2007 and Supp. ), § 4.3.4. 15 U.S.C. § 1641(f)(2). The provision should require disclosure to the borrower’s advocate with a properly signed release form. See NCLC Foreclosures, Appx. A, Form 3, infra. If the servicer provides information about the master servicer, a follow-up requestshould be made to the master servicer to provide the name, address, and telephone number of the owner of the obligation. Pub. L. No. 111-22, § 404 (May 20, 2009). See 15 U.S.C. § 1640(a). Congress chose to make creditors liable to borrowers for noncompliance by servicers.The TILA provision does not specify how long the servicer has to respond to the request. Perhaps because no parties were directly liable under § 1640(a) for violations of the disclosure requirement before the 2009 amendment, no case law had developed on what is a reasonable response time. In the future, courts may be guided by recent regulations issued by the Federal Reserve Board requiring servicers to provide payoff statements within a reasonable time after request by the borrower. In most circumstances, a reasonable response time is within five business days of receipt. Applying this benchmark to § 1641(f)(2) requests would seem appropriate since surely no more time is involved in responding to a request for ownership information than preparing a payoff statement. Alternatively, a 30-day response period should be the outer limit for timeliness since that is the time period Congress used in § 1641(g). announced a program to implement the new law. Official Staff Commentary § 226.36(c)(1)(iii)-1. See 15 U.S.C. § 1641(g)(1)(A)–(E). Under “MERS InvestorID,” notices will be automatically generated whenever a“Transfer of Beneficial Rights” occurs on the MERS system. A sample Transfer Noticeand “Training Bulletin” are available for download at http://www.mersinc.org/news. MERS is taking the position, based on the wording of the statute (which refers to “place where ownership of the debt is recorded”), that it can comply by disclosing only the location where the original security instrument is recorded because the note is not a “recordable Attorneys should request that clients provide copies of any ownership notices they have received based on this new law. Assuming that there has been compliance with the statute, the attorney may be able to piece together a chain of title as to ownership of the mortgage loan (for transfers after May 20, 2009) and verify whether any representations made in court pleadings or foreclosure documents are accurate. Failure to comply with the disclosure requirement gives rise to a private right of action against the creditor/new owner that failed to notify the borrower. Any written request for identification of the mortgage owner sent to the servicer will not only trigger rights under 15 U.S.C. § 1641(f) discussed earlier, but will also be a “qualified written request” under the Real Estate Settlement Procedures Act. Under RESPA, a borrower may submit a “qualified written request” to request information concerning the servicing of the loan or to dispute account errors. Because the servicer acts as an agent for the mortgage owner in its relationship with the borrower, a request for information about the owner should satisfy the requirement that the request be related to loan servicing. The request may be sent by the borrower’s agent, and this has been construed to include a trustee in a bankruptcy case filed by the borrower. Details about how to send the request are covered in § 8.2.2 of NCLC Foreclosures. The servicer has 20 business days after receipt to acknowledge the request, and must comply within 60 business days of receipt. Damages, costs and attorneys fees are available for violations, as well as statutory damages up to $1,000 in the case of a pattern and practice of noncompliance. Finding the loan servicer is generally easier because the borrower is likely getting regular correspondence from that entity. Still, the law requires that formal servicing transfer notices are to be provided to borrowers, and reviewing these can provide helpful information. RESPA provides that the originating lender must disclose at the time of loan application whether servicing of the loan may be assigned during the term of the mortgage. In addition, the borrower must be notified when loan servicing is transferred document.” If MERS members do not agree with this interpretation, they can opt out of MERS InvestorID and presumably send their own notice. See 15 U.S.C. § 1640(a). 12 U.S.C. § 2605(e). See also NCLC Foreclosures, § 8.2.2. (chapter 13 trustee, as agent of consumer debtor, and the debtor each have standing to send a qualified written request). 12 U.S.C. § 2650(a). See NCLC Foreclosures, § 8.2.3.
after the loan is made. Failure of the servicer to comply with the servicing transfer requirements subjects the servicer to liability for actual damages, statutory damages, costs and attorney fees.18 Unlike the TILA requirement discussed earlier, RESPA is limited to the transfer of servicing; it does not require notice of any transfers of ownership of the note and mortgage. To facilitate several voluntary loan modification programs implemented by the U.S.Treasury, both Fannie Mae and Freddie Mac allow borrowers to contact them to determine if they own a loan. Borrowers and advocates can either call a toll-free number or enter the property’s street address, unit, city, state, and ZIP code on a website. The website information, however, sometimes refers to Fannie Mae or Freddie Mac as “owners” when in fact their participation may have been as the party that had initially purchased the loans on the secondary market and later arranged for their securitization and transfer to a trust entity which ultimately holds the loan. Checking the local registry where deeds and assignments are recorded is another way to identify the actual owner. But do not rely solely on the registry of deeds to identify the obligation’s current holder of the obligation, as many assignments are not recorded. In fact, if MERS is named as the mortgagee, typically as “nominee” for the lender and its assigns, then mortgage assignments will not be recorded in the registry of deeds. A call to MERS is not helpful as MERS currently will only disclose the name of the servicer and not the owner. In addition, some assignments may be solely for the administrative convenience of the servicer, in which case the servicer may appear as the owner of the mortgage loan. 12 U.S.C. § 2650(b). See NCLC Foreclosures, § 8.2.3. 12 U.S.C. § 2650(f). See NCLC Foreclosures, § 8.2.6. See, e.g., Daw v. Peoples Bank & Trust Co., 5 Fed.Appx. 504 (7th Cir. 2001). See 27 NCLC REPORTS, Bankruptcy and Foreclosures Ed., Mar/Apr 2009. FREDDIE (8 a.m. to 8 p.m. EST). See NCLC Foreclosures, § 4.3.4A. The telephone number for the automated system is 888-679-6377. When calling MERS to obtain information on a loan, you must supply MERS with the MIN number or a Social Security number. 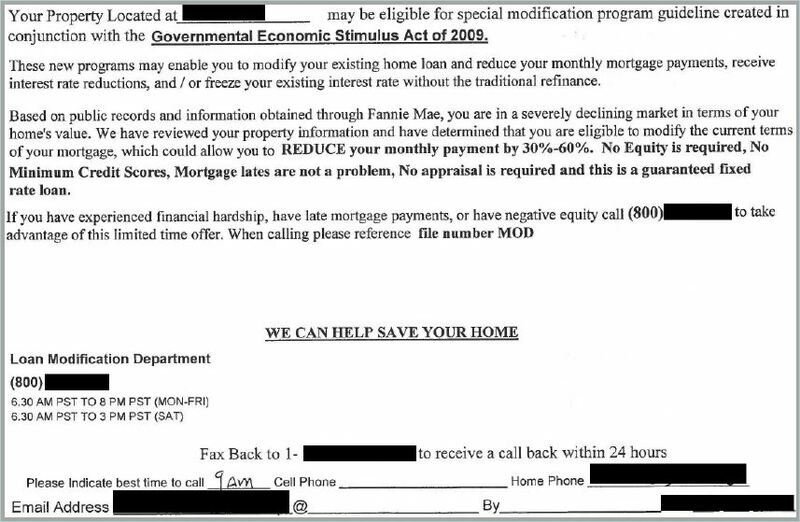 The MIN number should appear on the face of the mortgage. Many homeowners who found themselves in wrongful foreclosure situation may have a valid defense, against the perpetrators of these crimes. How much does it cost to get justice, when a bank forecloses on your house illegally? Thousands of ex-homeowners don’t pursue their rights to a financial settlement because they assume they couldn’t pay the legal fees. In fact, it costs less than you fear. Consumer lawyers take a few cases at no charge. More likely, you’ll pay fees — upfront or on a monthly plan — tied to the lawyer’s estimate of the time it will take and your ability to pay. If they win your case, they’ll collect from the financial institution, too. Before readers attack the “greedy lawyers” for defending “deadbeat” clients who couldn’t repay their mortgage loans, let me quote from a groundbreaking decision of 2011 by the Massachusetts Supreme Court. The court reversed two foreclosures because the banks — Wells Fargo and U.S. Bancorp, acting as trustees for investors — couldn’t prove that they actually owned the mortgages. Judge Robert J. Cordy excoriated them for their “utter carelessness.” The fact that the borrowers owed the money was “not the point,” he wrote. The right to deprive people of their property is a powerful one and banks have to prove they have the legal standing to do so. American law cannot allow property seizures based on backdated, incomplete, or fraudulent documentation, no matter what the circumstances are. Otherwise, no one’s home is safe. Courts enforce private property rights through the cases brought before them. In other words, lawyers. The Massachusetts case began not with consumers, but with the banks themselves. They asked the courts to affirm that the foreclosures were valid so they could get title insurance. That pulled the borrowers — Antonio Ibanez and Mark and Tammy LaRace — into the fray. When the horrified courts looked at how the foreclosures had gone down, they said, “no way,” and gave the former owners their property back. Ibanez, a special ed teacher, bought the home for investment in 2005 and defaulted in 2007 on a $103,500 loan, according to the court papers. Even since, the house has been boarded up. Ibanez filed a Chapter 7 bankruptcy, so he now has title to the home and no obligation on the debt. The mortgage investors will take the loss. The LaRaces have moved back into their long-unattended home, but first they had to clean up mold, fix plumbing, and make other repairs. They would gladly resume payments on the mortgage, their lawyer Glenn Russell says. But the trustee bank doesn’t own the loan. The investors don’t own it because the mortgage was never transferred properly. The original lender, Option One, no longer exists. So whom do they pay? This important case opens the door to thousands of foreclosure do-overs in Massachusetts at the time, and continuing and equally influenced courts in other states, as well. But there hasn’t been a rush by lawyers to get involved, probably because the field is complex and not especially remunerative. No class actions have been certified, as at that time or shortly thereafter, so the cases proceeded one by one. The financial trail can be hard to track (the Massachusetts documents were unwound by mortgage-fraud specialist Marie McDonnell). The lawyer — often, a sole practitioner — is up against the awesome resources of major financial institutions. Neither Ibanez nor the LaRaces were charged for their lawyer’s services. Collier had file a claim for wrongful foreclosure and was paid from any settlement. Russell did the same. At the time, Russell also thinks the LaRaces are owed something for the cost of repairing their home. An upfront fee. “Many of my clients were formerly very successful individuals,” Russell says. On average, the value of the homes of the people who contact him is “somewhat north of $500,000.” He suggests a fee based on their means. Monthly payments. If you’re not making monthly mortgage payments, some portion of that money could be applied to legal expenses. Collier says he puts the payments into escrow and retains them if he gets the house back (he says he always does, in predatory lending cases). Bankruptcy payment plans. The clients of North Carolina bankruptcy attorney Max Gardner are usually in a Chapter 13 monthly repayment plan. Each state sets the maximum attorney’s fee, payable as part of the plan. Most homeowners are successful fighting there case Pro Se using the package we offer for fighting Foreclosure, as your interest is at stake, and you have the most to lose, not Attorneys. They gets paid whether you win or lose. However, homeowners equally have options when fighting wrongful foreclosure. If you think you have a case, your toughest challenge isn’t fees, it’s finding a lawyer with the expertise to press your claim successfully, Gardner says. If you don’t have a personal reference for a qualified lawyer, the best place to look is the website of the National Association of Consumer Advocates. Next best: the National Association of Consumer Bankruptcy Attorneys. In either case, ask if the lawyer has won other securitization, mortgage servicing, and foreclosure cases. “They have to know what documents to ask for,” Gardner says. That’s what wins. Concerns with mortgage loan modifications do not always involve fraud. Each state has provisions and requirements for a senior lien holder to modify a loan and retain their lien position. Borrower submits false income information and/or false credit reports to persuade a financial institution to modify or refinance a loan on more favorable terms. 1. Capitalization of any amounts owed by adding such amount to the outstanding principal balance. 2. Extension of the maturity. 3. Change in amortization schedule. 4. Reduction or other revision to the mortgage note interest rate. 5. Extension of the fixed-rate payment period of any adjustable rate mortgage loan. 6. Reduction or other revision to the note interest rate index, gross margin, initial or periodic interest rate cap, or maximum or minimum rate of any adjustable rate mortgage loan. 7. Forgiveness of any amount of interest and/or principal owed by the related borrower. 8. Forgiveness of any principal and/or interest advances that are reimbursed to the servicer from the securitization trust. 9. Forgiveness of any escrow advances of taxes and insurance and/or any other servicing advances that are reimbursed to the servicer from the securitization trust. 10. Forbearance of principal whereby the servicer “moves” a certain interest free portion of the principal to the “back-end” of the loan, lowering the amortizing balance and the monthly payment. • In a declining interest rate environment a refinance generally will lower monthly payments. • In a rising interest rate environment a refinance to a fixed rate loan from an adjustable rate loan will generally allow the borrower to lock in the lower rate for the life of the loan. • In a period of rising home prices the refinance allows the borrower to withdraw equity. o Two years after the origination of a mortgage loan, a borrower contacted the lender, claiming a need to modify the loan. In an attempt to deceive the lender into modifying the loan, the borrower stopped making loan payments. The borrower’s original loan application indicated that the borrower earned $7,500 per month; however, the borrower subsequently claimed income of only $1,200 per month. While evaluating the need for the modification, the bank reviewed the borrower’s credit report and determined that the customer’s supposed annual income of $14,400, was insufficient in comparison to the reported $40,000 per year servicing other debt, which was current. The bank stopped the modification process, as the borrower had intentionally understated income in an attempt to defraud the financial institution. o A borrower contacted the lender claiming a reduction in income and trouble with making loan payments. The borrower provided the lender with a copy of his most recent tax return, which showed an adjusted gross income (AGI) of $45,000, down from the previous year’s $96,897. The borrower signed Form 4506-T, authorizing the lender to access tax returns filed with the IRS. In reviewing the tax information obtained from the IRS, the lender found that the borrower had recently amended the most recent return, lowering the AGI from $105,670 to $45,000. In this scenario, the borrower had purposely amended the return to reflect a lower AGI, possibly with the intent of amending it a second time to reflect the true amount of income. o A borrower requests a loan modification for a property that he claims to occupy. Based on the various facts provided to the lender, it appears that the borrower is eligible for a modification. When underwriting the modification, the lender verifies the borrower’s income with the IRS. During the verification process, the lender recognizes two potential problems with the information provided. The address on the tax return is different than the address of the house collateralizing the loan, and the return reflects rental income from real property. After additional investigation, the lender concludes that the customer was trying to modify the loan on rental property and not on the primary residence. o Borrowers’ willingness and ability to continue to pay debt and retain property. o Independent verification of information (employment, income, occupancy) provided. o Analysis of sustainability of performance post-modification. o Referral to reputable credit counseling service. • Establish legal department protocol for review of modification agreement (different states have different laws and language). • Establish strong post-modification loan performance reports. • Ensure proper accounting for delinquencies, trouble debt restructuring, charge-offs, and the allowance for loan and lease losses. • Borrower states that the property is his primary residence and is therefore owner-occupied but the mailing address and telephone number are not for the subject property (e.g., property is located in North Carolina; mailing address and telephone number are in New York). • Vague and/or unrealistic hardship (“the national economy”). • No documented resolution of hardship. • No or limited financial analysis in file. • Credit Report inconsistent with borrower’s stated hardship. • Financial reports that reflect low delinquencies that are inconsistent with local economic conditions or the bank’s loan portfolio composition. Mortgage fraud has continued to increase since the 2005. Declining economic conditions, liberal underwriting standards, and declining housing values contributed to the increased level of fraud. 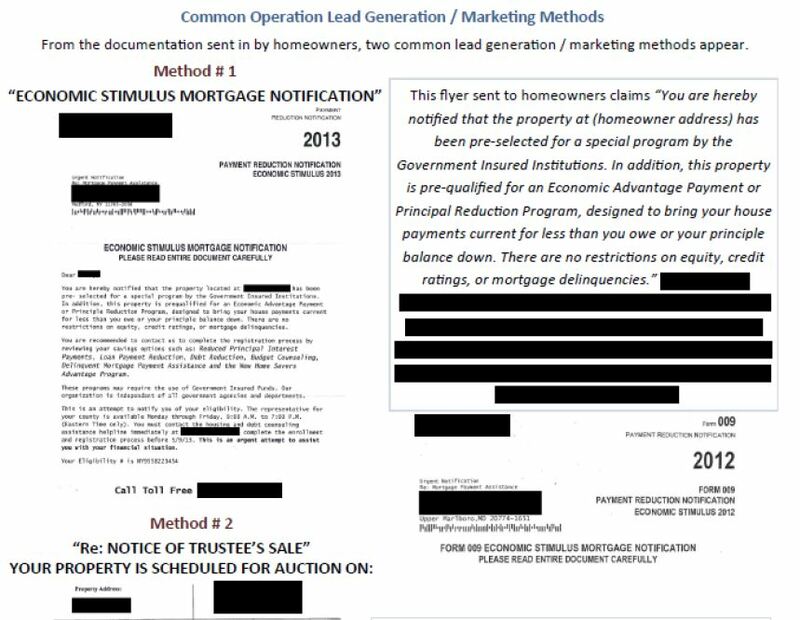 Market participants are perpetrating mortgage fraud by modifying old schemes, such as property flip, builder-bailout, and short sale fraud, as well as employing newer schemes, such as buy and bail, reverse mortgage fraud, loan modification, refinance fraud, and mortgage servicing fraud. This Post defines schemes as the big picture or secret plan of action used to perpetrate a fraud. 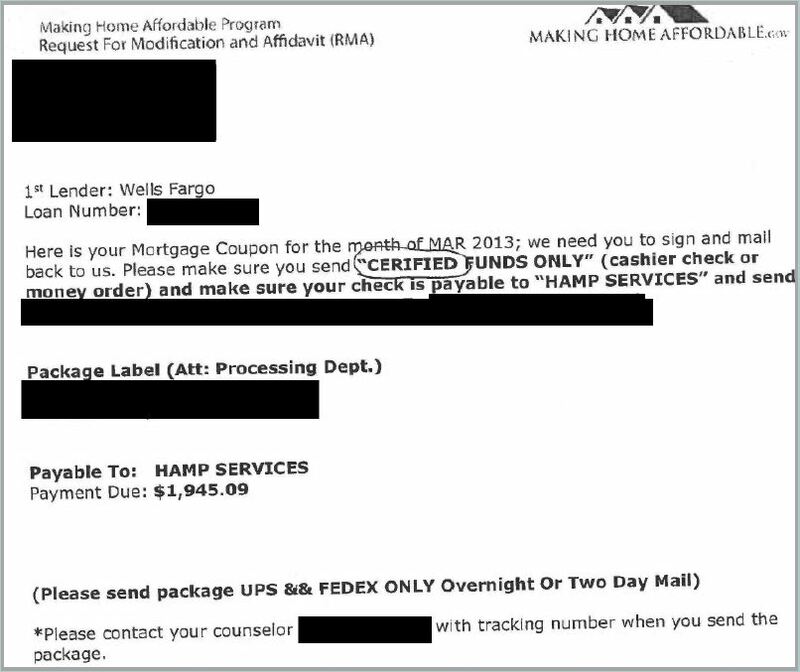 There are a variety of “schemes” by which mortgage fraud can take place. These schemes can involve individuals inside the financial institution or third parties. Various combinations of these schemes may be implemented in a single fraud. 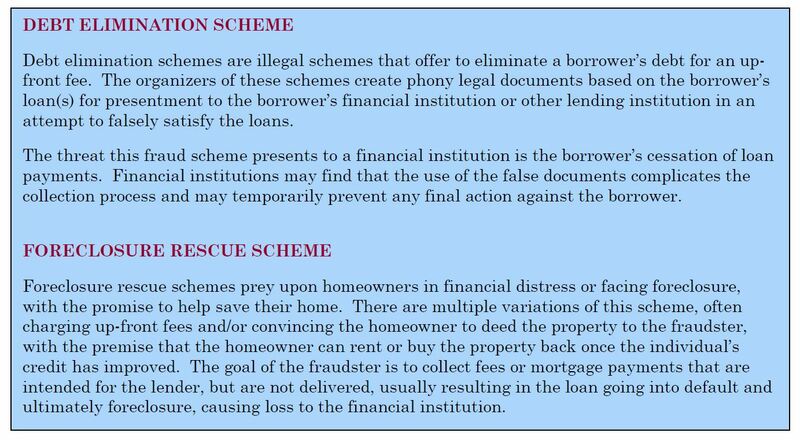 The descriptions provided below are examples of traditional and emerging schemes that are used to facilitate mortgage fraud. This scheme is used when a builder, who has unsold units in a tract, subdivision, or condominium complex, employs various fraudulent schemes to sell the remaining properties. This scheme typically involves a borrower who is current on a mortgage loan, but the value of the house has fallen below the amount owed. The borrower continues to make loan payments, while applying for a purchase money mortgage loan on a similar house that cost less due to the decline in market value. After obtaining the new property, the borrower “walks” or “bails” on the first loan. Chunking occurs when a third party convinces an uninformed borrower to invest in a property (or properties), with no money down and with the third party acting as the borrower’s agent. The third party is also typically the owner of the property or part of a larger group organizing the scheme. Without the borrower’s knowledge, the third party submits loan applications to multiple financial institutions for various properties. The third party retains the loan proceeds, leaving the borrower with multiple loans that cannot be repaid. The financial institutions are forced to foreclose on the properties. Double selling occurs when a mortgage loan originator accepts a legitimate application and documentation from a buyer, reproduces or copies the loan file, and sends the loan package to separate warehouse lenders to each fund the loan. Equity skimming is the use of a fraudulent appraisal that over-values a property, creating phantom equity, which is subsequently stripped out through various schemes. A fictitious loan is the fabrication of loan documents or use of a real person’s information to apply for a loan which the applicant typically has no intention of paying. A fictitious loan can be perpetrated by an insider of the financial institution or by external parties such as loan originators, real estate agents, title companies, and/or appraisers. This scheme occurs when a borrower submits false income information and/or false credit reports to persuade the financial institution to modify or refinance the loan on more favorable terms. This fraud is perpetrated by the loan servicer and generally involves the diversion or misuse of loan payments, proceeds from loan prepayments, and/or escrow funds for the benefit of the service provider. This scheme generally involves an individual or individuals who falsely transfer title to a property or properties and fraudulently obtain funds via mortgage loans or sales to third parties. A fraudulent property flip is a scheme in which individuals, businesses, and/or straw borrowers, buy and sell properties among themselves to artificially inflate the value of the property. Reverse Mortgage Fraud involves a scheme using a reverse mortgage loan to defraud a financial institution by stripping legitimate or fictitious equity from the collateral property. Fraud occurs in a short sale when a borrower purposely withholds mortgage payments, forcing the loan into default, so that an accomplice can submit a “straw” short-sale offer at a purchase price less than the borrower’s loan balance. Sometimes the borrower is truly having financial difficulty and is approached by a fraudster to commit the scheme. In all cases, a fraud is committed if the financial institution is misled into approving the short-sale offer, when the price is not reasonable and/or when conflicts of interest are not properly disclosed. Two additional fraud schemes, which are briefly addressed below, are debt elimination and foreclosure rescue schemes. While these schemes are typically not perpetrated directly on financial institutions, and therefore not expanded upon to the same degree as the above-mentioned schemes, the end result of the scheme can have a negative impact on the financial institution. This Post Paper defines mechanism as the process by which fraud is perpetrated. A single mortgage fraud scheme can often include one or more mechanisms and may involve collusion between two or more individuals working in unison to implement a fraud. Cash or other assets are temporarily placed in the borrower’s account/possession in order to qualify for a mortgage loan. The borrower usually pays a “rental” fee for the temporary “use” of the assets. In order to meet loan-to-value requirements, a fake down payment through fictitious, forged, falsified, or altered documents is used to mislead the lender. Appraisal fraud can occur when an appraiser, for various reasons, falsifies information on an appraisal or falsely provides an inaccurate valuation on the appraisal with the intent to mislead a third party. Fraudulent documentation consists of any forged, falsified, incomplete, or altered document that the financial institution relied upon in making a credit decision. A business entity that typically has no physical presence, has nominal assets, and generates little or no income is a shell company. Shell companies in themselves are not illegal and may be formed by individuals or business for legitimate purposes. However, due to lack of transparency regarding beneficial ownership, ease of formation, and inconsistent reporting requirements from state to state, shell companies have become a preferred vehicle for financial fraud schemes. Identity theft can be defined as assuming the use of another person’s personal information (e.g., name, SSN, credit card number, etc.) without the person’s knowledge and the fraudulent use of such knowledge to obtain credit. An individual used to serve as a cover for a questionable loan transaction. Appraiser – One who is expected to perform valuation services competently and in a manner that is independent, impartial, and objective. Processor – The processor is an individual who assembles all the necessary documents to be included in the loan package. Borrower – One who receives funds in the form of a loan with the obligation of repaying the loan in full with interest. The borrower may be purchasing property, refinancing an existing mortgage loan, or borrowing against the equity of the property for other purposes. Real Estate Agent – An individual or firm that receives a commission for representing the buyer or seller, in a RE purchase transaction. Buyer – A buyer is a person who is acquiring property. Seller – Person offering to sell a piece of real estate. Closing/Settlement Agent – An individual or company that oversees the consummation of a mortgage transaction at which the note and other legal documents are signed and the loan proceeds are disbursed. Title companies, attorneys, settlement agents, and escrow agents can perform this service. Local RE law may dictate the party conducting the closing. Title Agent – The title agent is a person or firm that is authorized on behalf of a title insurer to conduct a title search and issue a title insurance report or title insurance policy. Loan Servicer – A loan servicer is a public or private entity or individual engaged to collect and process payments on mortgage loans. Underwriter – The credit decision-making process which can be automated, manual or a combination of both. In an automated process, application information is entered into a decision-making model that makes a credit determination based on pre-determined criteria. In a manual process an individual underwriter, usually an employee of the financial institution, makes the credit decision after evaluating all of the information in the loan package, including the credit report, appraisal, and verification of deposit, income, and employment. Financial institutions often use a combination of both, with the automated decision representing one element of the overall credit decision. In each case, the decision may include stipulations or conditions that must be met before the loan can close. Originator – The individual or entity that gathers application data from the borrower. Alternatively, a person or entity, such as a loan officer, broker, or correspondent, who assists a borrower with the loan application. Warehouse Lender – A short-term lender for mortgage bankers. Using mortgage loans as collateral, the warehouse lender provides interim financing until the loans are sold to a permanent investor. Mortgage fraud continues to result in significant losses for financial institutions, as well as, the Homeowners. It is imperative that homeowners understand the nature of the various schemes and recognize red flags related to mortgage fraud. This knowledge and use of best practices will help with the prevention of mortgage fraud, and financial losses to the homeowner. Mediation is a dispute resolution process in which an impartial person, a mediator, helps parties negotiatea mutually acceptable settlement. Mediation is non-binding, guided negotiations. Mediators do notdecide matters; rather they rely on the ability of the parties to reach a voluntary agreement without coercion. Mediators are non-judgmental, who listen to the parties and assist and guide the parties toward their own solution by helping them delineate and focus on the important issues and understand each other’s interests. Mediators may suggest creative and innovative solutions for the parties to consider. Mediators have no authority to impose an outcome or decide the outcome of a foreclosure action.Mediators are not permitted to give you legal or financial advice. Mediators’ focus settlement discussions, relaymessages, clarifications, questions, proposals and offers and counteroffers back and forth between theparties. Mediators participating in the foreclosure mediation program are screened to ensure they have foreclosuremediation training in addition to basic mediation training. e current environment). Lenders are willing to talk with homeowner-borrowers aboutreasonable, practical solutions to bring aboutmortgage delinquency resolutions. 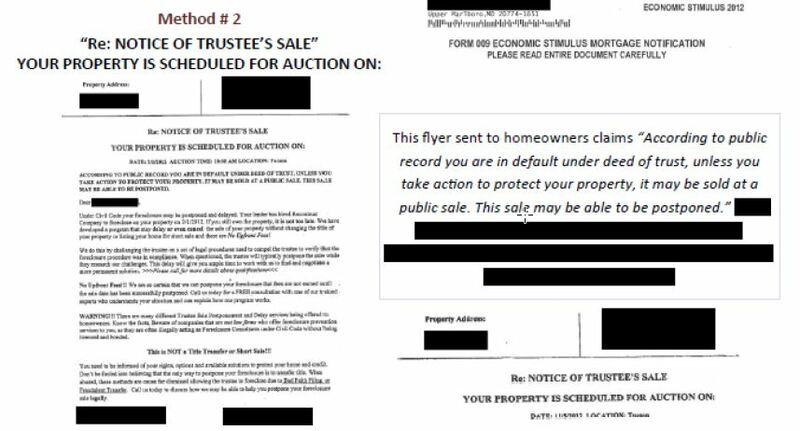 Upon receipt of this Request for Foreclosure Mediation and Financial Worksheet by the Office ofForeclosure, the material will be distributed to court staff in the local courthouse and to the lender’s attorney. Local court staff will assign a mediator to your case and set a date for the mediation when the lender and homeowner-borrower must appear. Note. A request for mediation does not stay or otherwise delay the foreclosure action. What Happens at a Foreclosure Mediation Session? At the mediation session, you will meet with the mediator, the lender’s attorney and a representative of the lender (this person may appear by phone). The mediator will explain his or her role and will organize discussions about what arrangements you and the lender can agree upon that will allow you to keep your home. Commonly, mediators hold private caucuseswith each party to (1) focuses each party on thecrucial factors necessary for a successful resolution and (2) help each party analyze the strengths and weaknesses of their positions. If the mediation is successful, a foreclosure mediation settlement memorandum will be prepared by the mediator and signed by all parties. Reinstatement: Your lender agrees that all amounts required to bring your loan current can be paid (including late fees, attorney fees, taxes, insurance, et cetera) and once these amounts are paid, the foreclosure will be dismissed and you will be back on your regular payment plan. Repayment Plan: An agreement to resume making your regular monthly payments, plus a portion of the past due payments each month until you are caught up (i.e., the lender raises the monthly payment for a set period of time until the arrears amount is caught up). Forbearance Agreement: Forbearance agreements are plans that allow borrowers to repay a loan delinquency over time. Regular monthly payments are made according to your loan agreement, and an additional monthly payment is made each month that is applied to the delinquent amount. Once the delinquent amount is paid in full, the normal payment amount resumes. It fully reinstates the loan. A forbearance plan may include one or more of the following features: (a) suspension or reduction of payments for a period sufficient to allow the borrower to recover from the cause of default; (b) a period during which the borrower is only required to make his/her regular monthly mortgage payment before beginning to repay the arrearage; (c) a repayment period of at least six months and (d) allow reasonable foreclosure costs and late fees accrued prior to the execution of the forbearance agreement to be included as part of the repayment schedule. However, they frequently may only be collected after the loan has been reinstated through payment of all principal, interest and escrow advances. Loan Modification: An agreement that permanently changes one or more terms of your mortgage. For example, (1) extend amortization (i.e., extending the number of years you have to repay the loan, such as, converting a 30-year loan to a 40-year loan), (2) converting a sub-prime 2-, 3- 5-, 7-year ARM loan into a fixed rate loan, (3) reducing the mortgage interest rate, (4) adding missed payments to the existing loan balance. Loan Guarantee Partial Claim: If your mortgage is insured, your lender might help you with a one-time interest-free loan from your mortgage guarantor to bring your account current. You may be allowed to wait several years before repaying this loan. Time to Refinance: Provided you have a reasonable prospect of arranging to refinance the loan, your lender may agree to some period during which it will not schedule a sheriff’s sale. HOPE for Homeowners Program is a program for borrowers at risk of default and foreclosure and provides new, 30-year, fixed rate mortgages that are insured by the Federal Housing Administration (FHA). Refinancing without the benefit of a government program may be impractical for most homeowners. In today’s falling market, home values are often less than the amount of the original loan and refinancing lenders generally will loan no more than 70-80% of the value of the home. Reverse Mortgage: Reverse mortgages, or home equity conversion mortgage (HECM) loans, are commonly used to help senior citizens tap into their home equity for retirement. As a foreclosure prevention device, you generally need to be age 62 or older and have adequate accumulated home equity. Principal Reduction: Loan principal is reduced. This may be possible if you have a negative amortization loan (you are paying less than is necessary to full amortize (payoff) the loan during the loan’s term) and the lender is willing to reduce principal to the original loan amount. A principal reduction program may be agreed upon in exchange for a shared appreciation mortgage (SAM). A SAM is a fixed rate, fixed term loan. In exchange for a lower interest rate, you agree to give up a portion of the home’s future value — the difference between what it is worth now and what it will be worth in the future. Principal Forbearance: Forbearance of the repayment of part of the principal interest-free. The actual principal amount due and payable at maturity of the loan (or sale of the property) is the original unmodified principal amount, less any and all periodic principal payments that you make until maturity or sale. The loan payments only partially, not fully, amortize the loan. Contrast with Principal Reduction. Mortgage Loan Assumption: Most mortgage loans include a “due on transfer” provision. If this provision is waived by the lender, it allows a qualified individual or entity to assume the loan’s payment obligations. This is often used to facilitate the sale of the property to a third party. The original lender may or may not release you from personal liability on the note if the individual or entity assuming the loan’s payment obligation defaults. Deed in Lieu of Foreclosure: With a deed in lieu of foreclosure, you voluntarily execute a deed conveying your property to the lender in exchange for the lender canceling, in full or partial satisfaction, the debt owed on the loan. The lender often will agree to forgive any deficiency (the amount of the loan that isn’t covered by the sale proceeds) that remains after the house is sold. The lender will also agree not to initiate foreclosure proceedings or to terminate any initiatedforeclosure action. Short sale: A sale for less than what you owe on the mortgage loan. Lenders may allow a home to be sold at a loss (consequently, the term short sale), because a short sale is nonetheless preferable to foreclosure. Foreclosure exposes lenders to potential substantial loss for litigation costs, carrying costs, including real estate taxes and insurance, and low forced sale bids or low resale prices. A short sale may be beneficial when a lender agrees to relieve you of liability for any deficiency (waive suing for a deficiency). Voluntary Surrender/ Cash for Keys: Lenders may offer homeowners money to leave the home voluntarily without a post-foreclosure judgment eviction, if the house is in relatively good condition and undamaged. What Happens If a Settlement Is Not Reached? If mediation is unsuccessful, the foreclosure action will continue, ultimately leading to a sheriff’s sale, unless of course, YOU COMMENCE LITIGATION OR BANKRUPCTY IMMEDIATELY!